Geesh!! I’m so tired of watering and not getting any results! This has been a very frustrating gardening season! I am embarrassed at the small amount of produce I have been able to harvest. I have yet to pick a tomato! I am not alone in this matter, other fellow gardeners are venting the same frustrations. To satisfy my cravings for fresh tomatoes, we went to the farmers market. Hallelujahs! Somebody has it figured out. As we piled out of the mini-van, I spotted a bushel of tomatoes. Of course, there was a line! They were the only farmers with tomatoes! I knew it would be well worth the wait. I bought five mouth watering, pulpy vegetables! It was very tempting to take a bite before I even left the parking lot. I have always been grateful for farmers markets. They have given me fresh produce when I didn’t have the time and space to plant my own garden. During my youth, the farmers market was a source of income (and entertainment) for my family. My dad plowed part of the corn field for my mom’s garden. From the fresh earth she grew enough vegetables to preserve fresh veggies for the winter, as well as enough to sell at the market. Every summer Saturday morning, we picked our produce and sold it out of the back of the ole’ family farm truck. Our market was on the west side of the courthouse, under large deciduous trees. Those of us growing up in this venue know that this is almost like an institution and a serious source of income for many farm families. Our customers were always friendly and loyal! They seemed to appreciate the fruits (or veggies) of our labor. In fact, thirty some years later my dad continues to supply the community with sweet corn. As a steward of his farm land, Dad has returned nutrients to the soil and utilized conservation practices so that he can continue to live off of the land. It feels good to support local agriculture and growers! It is always better quality as it is almost always fresh. Because I am too lazy to grow my own! I go to get the homemade jam. I’m not a jam maker… yet. It’s great to have such a wonderful variety of vegetables, fruits, plants and baked items. I love the spirit and enthusiasm of the growers. They recognize us as repeat customers and it’s great to get genuine customer service. The atmosphere is unique and fun. I like to take my kids. I want them to know their food is grown by farmers and not made in the back of the grocery store. Because it’s too darn hot for my tomatoes and I need to satisfy a craving! 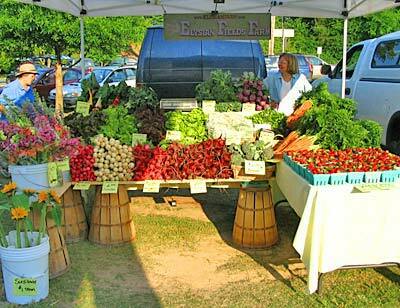 To locate a farmers market near you, go to the national farmers market search engine, sponsored by the USDA. I hope your garden season has not been as frustrating and unproductive as mine. But if it has, check out your local farmers market. They may satisfy a craving or challenge you to try something new.